BUFFALO, N.Y. — A sapphire-colored dye called methylene blue is a common ingredient in wastewater from textile mills. But University at Buffalo scientists think it may be possible to give this industrial pollutant a second life. In a new study, they show that the dye, when dissolved in water, is good at storing and releasing energy on cue. This makes the compound a promising candidate material for redox flow batteries — large, rechargeable liquid-based batteries that could enable future wind farms and solar homes to stockpile electricity for calm or rainy days. The research appeared online on Aug. 13 in the journal ChemElectroChem. "But what if instead of just cleaning the water up, we could find a new way to use it? That's what really motivated this project," says first author Anjula Kosswattaarachchi, a UB PhD student in chemistry. 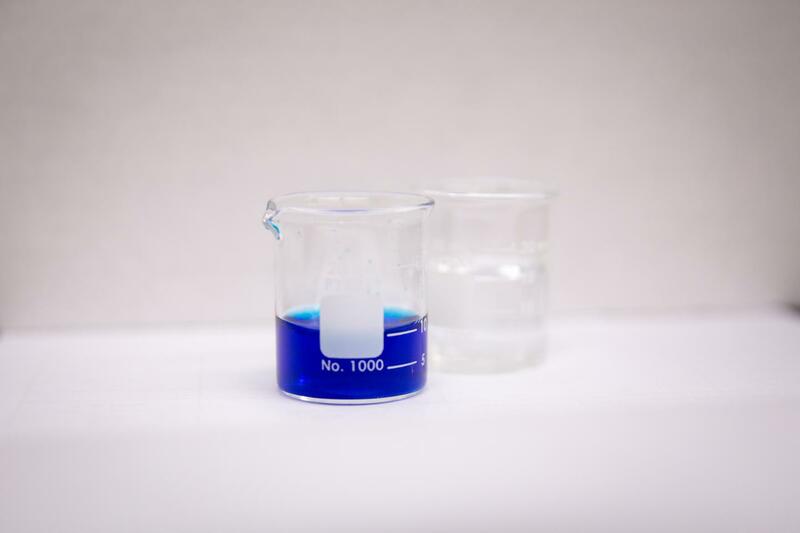 Upcycling methylene blue — and wastewater? The study is just the first step in assessing how — and whether — methylene blue from industrial wastewater can be used in batteries. "For this to be practical, we would need to avoid the costly process of extracting the dye from the water," Cook says. "One of the things we're interested in is whether there might be a way to literally repurpose the wastewater itself. "In textile-making, there are salts in the wastewater. Usually, to make a redox flow battery work, you have to add salt as a supporting electrolyte, so the salt in wastewater might be a built-in solution. This is all speculative right now: We don't know if it will work because we haven't tested it yet." The first battery the researchers made operated with near-perfect efficiency when it was charged and drained 50 times: Any electrical energy the scientists put in, they also got out, for the most part. Over time, however, the battery's capacity for storing energy fell as molecules of methylene blue became trapped on a membrane critical to the device's proper function. Choosing a new membrane material solved this problem in the scientists' second battery. This device maintained the near-perfect efficiency of the first model, but had no notable drop in energy storage capacity over 12 cycles of charging and discharging. The results mean that methylene blue is a viable material for liquid batteries. With this established, the team hopes to take the research one step further by obtaining real wastewater from a textile mill that uses the dye. The project is important to Kosswattaarachchi from a personal standpoint: Before coming to UB, she worked in textiles, developing new fabric technologies for the Sri Lanka Institute of Nanotechnology (SLINTEC). Textiles are one of the country's most important economic sectors, and the industry creates many jobs. But pollution is a downside, with wastewater an environmental concern.